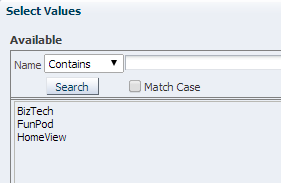 This post (done on obiee 11.1.1.7.140114) describes how to change the the search default from "Srarts" to "Contains" and un-check the Match Case mark (as default). This week 2 different customers requested the same: changing the search default to "Contains" with Match Case not marked. 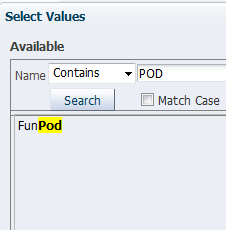 Searching 'POD' will return nothing in default case but will work in the requested case. The change, while possible is not desirable and I'm not sure it's supported. Changing the default to Contains is in OBIEE Eklavya blog (kalpesh-obiee-eklavya.blogspot.com) here. (the second part, the first is for OBIEE 10). Removing the mark is described in the blog Oracle BI in Russian (obi2ru.blogspot.com) here. (Regarding this option, the changing in nqsconfig.ini of CASE_SENSITIVE_CHARACTER_COMPARISON = ON; to OFF, influences the sort rather than search, so not relevant in this case). To summarize (see detailed instructions in the original blogs) you have to modify 2 java script file. Backup and causation are important. Remember that the files will be replaced in future patches. In those cases it's better to repeat the change rather that placing backup files, since the files might change as part of the patch. Be aware, in one example, not so careful change of this sort, caused the Subject Area content to be empty in Answers. Not ideal situation. When you backup, if you do it by copy/paste in the same folder. please change the file extension. As a rule of thumb, don't leave unnecessary .js and .xml files in OBIEE installation. * I'm not sure the first file change is needed. Changing only obips.dropdownsearchdialog.js seems to do the work. I'm still investigating. No need to restart the BI server, but clearing the browser cache might be a good idea (Ctrl+Shift+Del in most browers). Hyderabadsys Obiee online training Every Faculty has Real Time experiance.Trained Resources placed in countries like Australia, USA, UK, JAPAN, SWEDEN etc.Any important problems round-faced by resource resolved victimisation Teamviewer, webex.Supporting the resource with high a hundred Interview queries.Resume inbuilt best company standards in keeping with the work description Obiee online training. Very useful really good information. Thank you so much for your post it's very useful, but I have a problem with the part to change the option "Contains" instead "Starts". I've replaced the code as you suggested but I don't have success.